For Laurie's birthday we go to the other end of Puerto Rico, the west end, to stay at the Tres Sirenas Ocean Front Inn in Rincon. We had a relaxing weekend, every evening we soaked in the jacuzzi while listening to the crash of the surf on the beach. Every morning we had a gourmet breakfast served to us on the porch in front of our room. Harry & Lisa, the owners, told us all about their Bed and Breakfast and the renovations they went through getting it ready and the Caribean decor. Harry took us on a ride all over Rincon to see the other b&b's in the area as well as restaurants, night life and surf spots. Bill and Laurie of the rainforestinn.com go to Hacienda Carabali and interview Alejandro Diaz Carlo. We find out about the many adventurous you can have on their six hundred acre ranch. There are guided horseback rides on Puerto Rican Paso Fino horses as well as mountain biking and four track rides. He tells us about the history of Hacienda Carabali which his grandfather founded more than forty years ago. He recommends the best days and times to come riding. He also offers special private rides for equestrians. Please email Bill & Laurie bill@rainforestinn.com to make comments about this podcast. We want your feedback! Steve Selin of Selin and Harris Violins was playing the violin. 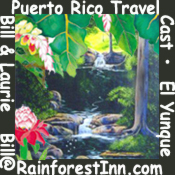 Rainforestinn.com's Podcasts from a bed and breakfast deep in the El Yunque rainforest of Puerto Rico. New travel adventures.